When I did my review of Legenderry Green Hornet, I mentioned that I loved Dynamite’s out-of-the-box crossovers like Legenderry and Song of Sorrows. Writing this review, it occurred to me that I completely forgot to mention Masks. Huge mistake on my part! Masks was a team-up of many of Dynamite’s pulp characters. This year, Dynamite decided to up the ante with Masks 2. Masks 2 is going to feature pulp heroes from the 30’s, 70’s, and modern day all dealing with the same threat, a new villain called The Red Death. 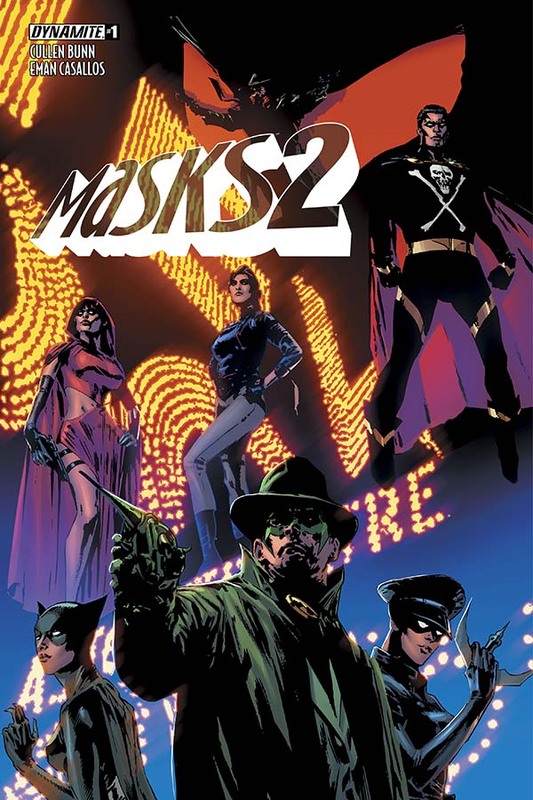 I actually still have not read Masks, but when I saw Cullen Bunn was doing Masks 2, I decided to check this series out. I am a huge fan of Bunn's work, and he is the perfect fit for this kind of pulp adventure. Masks 2 starts in New York on October 15, 1937. Skull-masked thugs are loading some kind of canisters onto trucks. They are interrupted by The Shadow. Soon after, Green Hornet and Kato join the fun. Some of the goons try to escape, only to be stopped by The Black Terror. We find out the canisters were loaded with some kind of bioweapon called The Red Death. Soon our heroes are joined by The Spider, Green Lama, and Lady Satan. Green Lama warns them that there is a threat coming that will affect the past, present, and future. Spider says that there is a Masquerade Ball tomorrow and the one responsible for the Red Death will be there. The heroes all make their way to the party and the issue ends with the revelation that The Red Death is a women with a skull mask. I actually liked this issue a lot, but there is one quick criticism I need to get out of the way. On the last page, they seem to be trying to go for a huge cliffhanger by revealing The Red Death…but I didn’t feel anything other than some mild sadness that the issue was already over. At first I thought maybe I was missing something and this was a surprise revelation connected to the first series, but when I read some interviews about Masks 2, Red Death is a new villain. So it made the last page kind of strange and awkward. Thankfully, this issue had a lot to offer beyond that last page. The characterizations of all the characters were done real well. I especially loved the conflict between Green Hornet and the Shadow. The Shadow seems far more willing to kill bad guys than Hornet is. I also thought that was a nice callback to the stories of the 30’s. Even characters like Batman were a lot more kill-happy back then. We always hear about the violence of comics in the 90’s, but they barely hold a candle to the violence of the 30’s. Another thing that was great about this issue is how smoothly the characters were introduced and meshed together. I don’t know much about Spider, Green Lama, or Lady Satan, but Cullen Bunn gave you just enough information to see how they fit in the story without overloading the reader with exposition. These are the heroes. These are the villains. You’re in for a hell of a ride, hang on tight and don’t worry too much about the details. To me, that is the perfect way to do a crossover. I also loved how they teased Masks 2’s bigger story. Cullen Bunn said in an interview that Masks 2 will feature heroes fighting Red Death through 3 different time periods, and Green Lama did a great job building anticipation for it. I might have liked them to mix things up a little more in the first issue, but that didn’t take away from my enjoyment of the story. Eman Casallos is a great choice for the art on this book. His work here has a gritty, pulplike feel to it. I really liked how he drew the classic Green Hornet mask and the Shadow’s costume. And the skull-masked goons looked exactly how faceless goons of the period should look too. And that is one of the biggest selling points for me. This definitely looked like a modern day interpretation of a pulp hero comic. Everything about the art and writing just fit so well. If this comic showed up in someone’s old comic collection, it wouldn’t feel all that out of place. I really enjoyed this issue, and I definitely will be picking up Masks now too! Every week, I find myself buying more and more Dynamite comics. They are quickly becoming one of my favorite comic companies. Captures the look and feel of a pulp comic very well. Great action sequences and a real compelling story. Terrific grasp of what makes these characters iconic. The last page was a strange place to end it. Didn't quite feel like an impactful cliffhanger. Would have liked to see a little more teases in regards to this story taking place in different time periods. Is it worth your $3.99? Yes. Masks 2 is high-action with terrific characterization and great art. Dynamite has another brilliant crossover on their hands here. Definitely worth checking out!